The IC Chip Tester is one of the least talked about pieces of testing equipment, and few even know that they exist. There seem to be a slightly lower quantity of these around than other NES testing items, probably due to the fact that to the untrained eye they look like a regular NES system that someone cut the bottom out of (This probably made them more prone to being thrown away). These testers were meant to sit upside down, exposing the main board of the system. 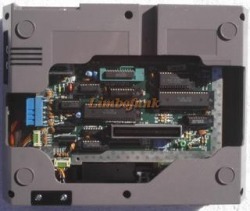 Instead of having soldered IC chips like regular NES consoles, these units were made with built in mechanisms to lock the chips in place. This way, if a certain IC chip was thought to be the cause of a malfunctioning NES console, the chip would be desoldered and placed into the Chip Tester for testing. This was also used to test chips before they were soldered into the NES console that was being repaired to make sure it worked properly.